London (CNN Business) 1. Facebook data: Germany’s anti-trust office has ruled that Facebook (FB) is abusing its dominant position in social media by combining data from other sources such as Instagram, WhatsApp and third party websites to build a unique profile of each user. Facebook said it disagreed with the conclusions of the investigation and intended to appeal. “Using information across services helps to make them better and protect people’s safety,” the company said in a statement. 2. Central banks in focus: India’s central bank cut interest rates Thursday for the first time in six months. The move by the Reserve Bank of India was unexpected — two-thirds of economists polled by Reuters had predicted the bank would keep rates unchanged. The bank cited a drop in inflation, lower oil prices and a global economic slowdown as factors behind its decision. The Bank of England kept interest rates on hold on Thursday, but slashed its growth forecast for 2019 to 1.2%. The UK central bank said Brexit uncertainties “had intensified considerably” since its last meeting in November. The United Kingdom is due to leave the European Union in just 50 days but still does not have an agreement in place to protect trading links. More worrying economic news came from the eurozone on Thursday. The European Commission slashed its forecast for growth in the eurozone this year to 1.3% from 1.9%. At the same time, latest data from Germany revealed the country’s industrial production declined in December, increasing fears that the biggest economy in Europe might have slipped into recession. “Three weeks ago, the Federal Statistics Office said that they thought Q4 GDP was ‘a small plus’, but that may now have to be revised to ‘a small minus’,” said Andrew Kenningham, chief Europe economist at Capital Economics. 3. SoftBank soars: Shares in SoftBank Group (SFTBY) spiked nearly 18% in Tokyo on Thursday after the company announced it would buy back as much as 600 billion yen ($5.5 billion) of its own shares in the next year. The stock surge is a boost for CEO Masa Son’s strategy of transforming SoftBank from a telecoms operator into the world’s most powerful tech investor. The share buyback takes a leaf out of Warren Buffett’s playbook. Buffett’s Berkshire Hathaway (BRKA) has a policy of buying back its shares if the price falls below a certain level. Analysts liked the SoftBank move. “We have long argued that Softbank must take cues from Berkshire Hathaway,” Atul Goyal, an analyst at investment bank Jefferies, said in a note to clients. 4. Total’s record year: Total (TOT) has joined the ranks of oil companies reporting strong profits and rising production. The French company said Thursday its output jumped 8% to a new record of 2.8 million barrels a day in 2018. It is set to rise further in 2019. Total announced it has opened a new oil and gas province 175 kilometers (109 miles) off the coast of South Africa after making a “significant” discovery there. BP (BP), Shell (RYDAF) and Exxon Mobil (XOM) also reported strong results in recent weeks. Despite the strong earnings, shares in Total declined 0.8% in early trading in Paris. 5. Global market overview: US stock futures were pointing lower early on Thursday. European markets opened down, following a negative session in Asia. The Dow Jones industrial average closed down 0.1% on Wednesday. The S&P 500 shed 0.2%, and the Nasdaq dropped 0.4%. 6. Earnings: Dunkin (DNKN), Fiat Chrysler (FCAU), GrubHub (GRUB), Hanesbrands (HBI), Kellogg (K), Philip Morris International (PM), T-Mobile US (TMUS), Twitter (TWTR), Tyson Foods (TSN) and Yum! Brands (YUM) plan to release earnings before the open Thursday. 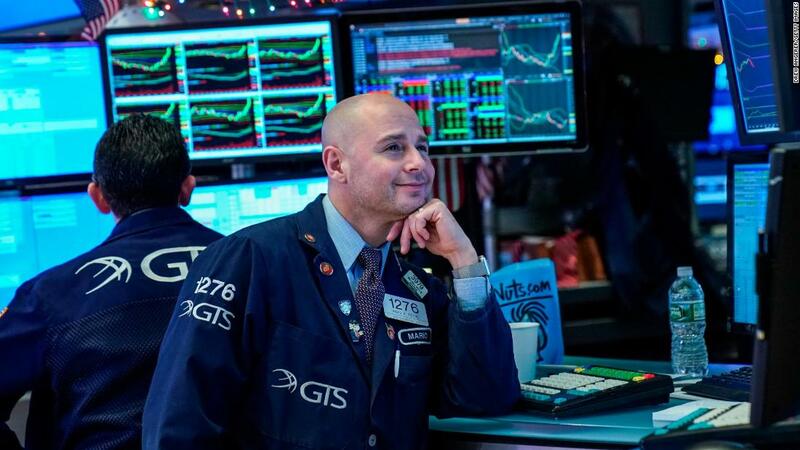 Columbia Sportswear (COLM), Lions Gate Entertainment (LGFA), Mattel (MAT), Motorola Solutions (MSI), News Corp (NWSA) and Western Union (WU) are set to release earnings after the close.